There was nothing more bleak than a game between the Cubs and the Mets around 1979-1980 at Shea Stadium. Everything felt depressing, the uniforms, the players, and the atmosphere. You have to feel sorry for Martin, he left the Phillies right before they went to the World Series to go to the Cubs. 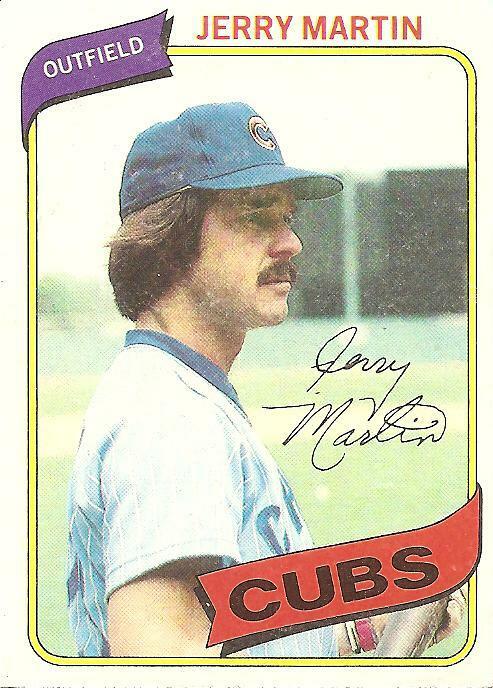 Martin was part of the trade that brought Manny Trillo and who became a big part of that 1980 team. Did I read that right? You’re writing a book about Bad News Bears? Yes, specifically The Bad News Bears in Breaking Training. Still working a few things out with making that project 100% official, but I’ve been having a lot of fun working on it. It’s interesting to me how big that Pittsburgh drug trial was at the time–and all the various cocaine issues–and how relatively forgotten they are now. When Darrell Porter came back from his rehab stint (it must have been 1980, maybe?) there was a lot of apprehension how he’d be treated (welcomed back with open arms) and five years later it was easier to name the guys not connected with cocaine than list the ones who were. gedmaniac: That picture is my second favorite thing this week after Darnell McDonald. gedmaniac, as I am reading your comment about R.E.M. KEXP.org is coincidentally playing “Nightswimming” by R.E.M. Pardon my extreme randomness, but what I really noticed about this card is Jerry’s signature. With that weird little dot at the end of the crossing-his-t flourish, half of his last name looks a lot like a Pac Man ghost. Inky? Blinky? Pinky…. Clyde? That’s awesome, Josh. I won’t bother with any of the dozen of specific questions that Just popped into my head. I cannot think of a more fitting bibliographer for Kelly Leak and the Bears, Josh. You have pre-sold that work to at least one customer already. Please keep us briefed.